When you sit down and discuss topics like manners, playing nicely and homework with your child/ children, please also take the time to add disability awareness, and accepting everyone’s differences. Here’s some advice on discussing disabilities with your child. Around the age of four years old, you will start to notice how aware your child has become of the differences between others and themselves. They may notice if someone doesn’t look, talk, or behave in the same way as them or others they are familiar with. This is when your child may start to ask questions about the differences they notice. It’s normal for your child to be curious. And it’s important that you answer these questions the best way you can as whatever you do say will lay the foundations. When your child starts to become more aware of others with a disability, it might be someone they may have seen whilst out, or someone in their class. The best way to start discussing disabilities with your child would be to start pointing out the ways that you and your child are different – your hair colour, skin colour, the way we speak and dress. In this way, you are helping with your child’s ability to accept all the ways that people can be different from her or him. Also include that while we are different in most ways, we are still the same in lots of other ways. A child may be in a wheelchair, but still may enjoy the same games. When you and your child see someone with a disability, carry on as usual. This will help your child to see that regardless of differences, we should all be treated the same. Sometimes discussing disabilities means setting a positive example for them to pick up a positive attitude. Lastly, find up to date books, clips, videos to show your child that promote diversity and disability awareness. We are raising the next generation…let’s make it count! Sharmika has set up Beyond Strength, a network of parents parents managing long term health issues or disabilities, either first hand or with their children. 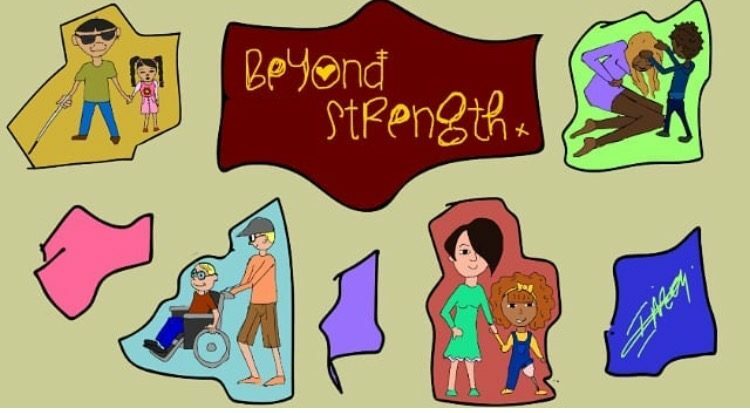 You can join Sharmika’s supportive community of parents living with disabilities, by following Beyond Strength on Instagram. For more blogs by other young parents around disability and additional needs, please see here.